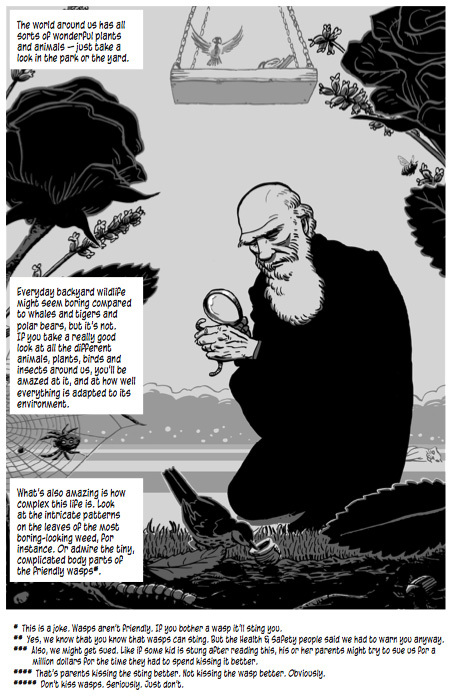 Snapshot from a graphic novel of Charles Darwin’s life. The following animation–via the very resourceful blog, Brain Pickings–illustrates the general workings of a theory that will be addressed next semester, the theory of evolution. This animation of about 12 minutes, is simple, funny and insightful. I am amazed at the fact that we exist because of natural selection. This process started even before we were born. Now that I think about this I have noticed that every day life is the perfect example of natural selection. When applying to any type of job and/or university we all go through this process which means that when we learn about natural selection we are learning about how to survive in our present day society. I know this video seems really childish and although I understood how the hares with the best fur color survive, I don’t understand how the rabbits and hares have evolved and come up with this adaptations to change the color of their fur. Rabbits and hares have evolved their furs according to solstices, the position of Earth and the Sun during the year. So, the amount of sunlight «selects» the progeny that progeny that is better suited for either solstices. Ohh that’s really interesting. Its incredible what nature is capable of doing. Thank you. Evolution is everything in biology. Evolution has led to other subject, like history. It is the explanation for changes in life. The study of evolution has led to genetics which is an extremely important subject. It will help humans improve in the future, it will help humans find the cure to many diseases like cancer and in it will help correct mutations. The study of genes and DNA will also lead to knowing diseases earlier, by studying a piece of genes scientist will be able to tell the diseases on your genes that have not developed. I would infer that in the future when humans understand genetics perfectly we would be able to create or design a human before birth, we would be able to chose or change traits, creating a more effective human. If we plan to have a proper understanding of Biology–and even contemporary thought–, we need to understand evolution. Imagine trying to understand modern physics without the contributions of Leibniz (which, by the way, invented Calculus). Such is the importance of evolution to a Biology course. And I totally agree with you on that matter. But we have to tread carefully, with cautious optimism, in regards to biotechnology and eugenics. (I encourage you to Google these two words: biotechnology & eugenics, they will probably be of some interest to you). It is very helpful that in a very short, but detailed video the concept of evolution and what it consists of it is explained with simple examples. Adaptation is a very crucial term in evolution. Organisms go through adaptation in order for their species to continue living on Earth. For me it is very interesting how organisms adapt to the environment and their changes, like the finches in the video. I researched and looked up other animals that have passed through this process of adaptation in order to survived. I was fascinated by how frogs and turtles freeze during the winter to survive the change in climate and then continue on their lives in the spring. Other animals that are going through adaptation right now are the polar bears. Due to global warming their surroundings have changed and they have had to change with it their survival routines. In the same way scientists have created a mating process for two different species to unite and create a new one, they should create a process in which they could facilitate the process of adaptation for animals. Along with it, they could create volunteer programs so people can see how difficult it is becoming for animals to adapt to their environment in consequence of the danger humans are creating in the world. Here is a link I found about the animal adaptations to hostile environments. Amazing. I did not know about amphibians freezing during winter to maintain homeostasis. And scientists designing alternative reproductive patters for endangered polar bears, mind blowing. Frogs freezing is very sci-fi. Great link, Ana. This explains why ‘satos’ are so resilient to injuries, birth pangs, sicknesses, etc. Genetic variability, via natural selection and sexual reproduction, ensured success for animals such as dogs and primates. Evolution is the key of life. Everything in our world depends on evolution because without it our world today wouldn’t exist. This video helped me to see more clearly this term and understand it better. It is very interesting knowing from where a specie came to our world and more important where us humans came from. This is a very controversial theme because there are many theories about the human evolution depending on scientists opinion but I still don’t know which to believe. Science gives us tools to enhance our senses and better understand the natural world–ourselves included. Scientists measure, compare & and contrast with these tools. The result of what scientists do with the tools of science is knowledge (or theories that explain, with data, the natural world). With this I mean that science is not a matter of belief, it is a matter of knowledge. To me this video seems interesting not only because it explains every detail of the process of creating new organisms but because it made me understand the evolution between animals. The story of the finches made me understand how they adapted and created new types of finches around the island and how this happens with other organisms. The traits of adaptation that are passed on generation to generation originate new organisms therefore organisms can reproduce in other places other than the place they lived before. The animals in differente parts of the world adapt and become immune to different types of enviroments and reproduce faster. The video helped me visualize how the process of evolution occurs. In the link below the term of evolution is explained with more detail. Great link, Valeria. Keep in mind that to understand evolution we have to make sense of concepts like «emergence»; which is why I’ve used the metaphor of the spiral several times during the semester. Clearly, evolution is as close to a fact as there is in science. It is proven by fossil and easily seen evolution in later specimens. It is proven by DNA which shows relationships that helps confirm the evidence from fossils. It is not really debatable. We all have monkeys in our ancestry and later apes. They are not the living variety but they clearly were still monkeys and apes. Awesome find, Andrea. I love Bill Nye, the Science Guy. As I watched the video about natural selection I decided to look for videos about Charles Darwin and his discoveries. I remembered that we spoke about him and the example of the finches during our 7th grade life science course with Mr. De la Torre. As I was searching for Charles Darwin on youtube I stumbled on a funny song about him and his discoveries. Its one of the horrible history videos that they show on BBC. I found it very amusing although not necessarily funny. I would also like to point out for those who decide to watch it that we are not descendant from monkeys. Hope you enjoy it. Almost everything today is based on evolution. Evolution is the reason why we are who we are today and why there are so many species out there with their own unique traits. If it weren’t for evolution nothing would be the same. The majority of living thins would be dead and we still wouldn’t exist. I found this video and it is really great in explaining to us evolution and how crucial it is in order to have life. The human has always had one that has prevailed through generations: “where do we come from?” and it is hard to think about humans or creatures 4,500million years ago and how much they have changed through years leading us to what we are now (and who knows how we will continue adapting and changing a million years from now) Evolution has always been a difficult subject to understand since there are many theories but none 100% proven. This video gave me the opportunity to understand one of the theories in a fun and understandable way and it is actually incredible the way organisms behave to adapt, reproduce and survive even though there are not two exactly the same. There’s a huge wealth of information that supports and proves evolution by means of natural selection. I encourage you to research on Google images «horse evolution». The relationship between us and our ancestors is called “eslabón perdido” which is the hypothetical species that modern humans join their ape ancestors. Australopithecus, ancient bipedal hominids with a mosaic of ape and human features, that role well. This link is in Spanish because I couldn’t find it in English but it is still a very inserting thing. There is no doubt about evolution being a fact, that has been proven using core samples from the bottom of the ocean and studying the fossilized development of micro species. So even with the gaps due to the rarity of fossilization there is no doubt where we came from. Evolution is the change in allele frequency over time in a population of organisms and is not subject to opinion. The theory of evolution by natural selection explains, with overwhelming evidence, how evolution happens; also not subject to opinion. The problem with evolution is the fact that is usually preceded by the word «theory». «Theory» does not mean ‘speculation’. In the context of science, a theory is a very, very, good explanation of natural phenomena. Evolution is such and interesting subject. Yet I find that is a topic that can become a very contradicting one. It is a topic that in my opinion is based on personal beliefs. I really like learning and researching on this theory. I am looking foward to debating this topic in more depth in class next semester. The theory of natural selection is based on science—observation, to be exact. The arguments against evolution are based on ideology: personal beliefs usually associated with religion and, in many cases, lack of scientific literacy. This video simplified a complex subject in biology, making it very easy to understand. Evolution is a very interesting subject and all the theories made based on it will certainly lead to discovering where humans came from. In my opinion, the theory by charles Darwin is very well thought, and since it has a lot of supporting evidence, i think it won’t be long before it is fully accepted as correct. In this website you will find some charts with explanations on the beginning of life (including evolution). The theory of evolution is very intriguing. Scientists have found every resource they can to understand and develop ways to explain this interesting topic for people who do not believe in it. It is a debatable topic against religion due to the fact of all the evidence found. Since religion is based on faith than on evidence, it can be a very contradicting topic also. A lot of controversy around the topic of evolution; which makes it a very rich one, too. We can learn a lot about the political and educational contexts of both, England & USA. And it is a very hot button issue even till this day. One great way to uncover the evolutionary processes of species is by examining fossil. Fossils are preserved plant, animal and other organisms from the past. They are important in that they tell us about the organisms that roamed the earth billions of years back. Scientists use them to gather information about the lives and evolutionary relationships of organisms, for understanding geological change and even for locating fossil fuel reserves. Perhaps one of the most important functions of fossils from a scientific perspective is that they constitute one line of evidence for understanding evolution. Using information pieced together from fossil evidence, scientists can reconstruct body types of animals that no longer exist and put together a “Tree of Life” to describe the evolutionary relationships between organisms. Therefore, fossils tell how life has evolved from a simple to a more complex state. Natural selection is a very complicated process which basically forged every living thing in our Planet Earth to what it is today. It continues happening daily, nature takes its course in order to keep improving species making them stronger and more capable of surviving. We must stand conscious and understand that this process is the work of forces out of our human limitation. People do not have the power of deciding what or who should continue living, this behavior should not be tolerated. It is essential for humans to continue evolving together as a species towards a brighter future. Indeed. Evolution by means of natural selection shows us that every single living thing on this planet is precious; many millions of years & and trillions upon trillions of genetic mutations—favorable ones—had to take place in order for even the simplest bacterium to be alive today. And that is a very big deal. Everyone knows that evolution is the thing that created the diversity among organisms. We all know every single organism had an ancestor but the problem is that scientist can tell all ancestors and where exactly in Earth’s timeline did these organisms start changing or evolving in other species and change completely. We have always assumed that dogs came from ancestral wolves but we don’t know WHEN dogs appeared on Earth. Scientist have experimented and tested different wolves and dog breeds to find out how they were related, and in the end the experiment resulted in the answer but it could not say the exact location of where this evolution occurred. Scientist now debate on whether it was on Asia or Europe or any other place. It is very interesting to think that everything and everyone comes from a common ancestor. Evolution has made an impact in the world and with natural selection many species have come to be what they are today. Everything has been complex since the origin and I can’t imagine how much more complex the world will come to be in the future. No one would have imagined how the world would become what it is today and for that reason it is very difficult to imagine a world much more different from what it is today but because of evolution, what will happen is very uncertain. If an AP Bio students finishes a course knowing that evolution is a core theme in Bio, the teacher should feel some sense if accomplishment. Having clear that we as humans evolved form other humanoids to adapt to our time, a big curiosity entered my mind. This curiosity is “In which ways us humans will evolve to adapt to our future?”. Maybe we will develop stronger lungs to resist pollution, lose hair because we don’t need it because of clothes, or even evolve to spend more time in water due to global warming… who knows how can we change. This video shows some possibilities for our future evolution. Evolution is truly amazing. To think hundreds and hundreds of years back, organisms were evolving and still today every organism is evolving. Always evolving and adapting to new circumstances while others succumb to them is a sad but fascinating life process. The diversity of life is immense and the idea that we all derived from a primitive protozoa is mind boggling. To think of all the millions of organisms and yet how each of them is unique is exciting. Through this process of evolution the real mastermind is DNA. Something as microscopic, that we can’t control and look at all the wonders it does. It gives every single organism unique factors to make them different yet unites them all at the same time. DNA has this amazing power of recombining and giving you strong bones or mutating and giving you cancer. Although scientifically proven, it is very difficult to understand the concept of evolution. It is hard to comprehend that living things could all have started with an unicellular organism and evolve its way up to become all the diverse and complex species of living things that we have on Earth. This post helped me understand it a little better and it was quite interesting. I agree. It can be difficult, but it does not has to be. This is why I wrote this post; to show that simple explanations of complex concepts are possible. The mayor hurdles we encounter when studying evolution have a lot to do wit our human limitations: even though our brains are huge and highly complex, to understand concepts like “a billion years” can prove to be quite challenging. Nevertheless, we can make sense of huge timescales if we use appropriate metaphors. I think that the cosmic calendar we have in our classroom can be quite useful for this. It’s interesting how far evolution has taken us over time, and it’s interesting to imagine how humans will keep evolving over time. I found this article that shows different ways in which we might evolve in the future, and one thing that stood out to me was that we could be responsible for our own evolution, through things like “:designer babies” or even more common technology, instead of just depending on adaptations. I enjoyed this video cause it explains evolution very well. I am interested in discussing this subject more, but, since we’re not gonna start on it till’ the next semester, I researched a bit myself. I grew up in a religious environment, so this article http://evolution.berkeley.edu/evolibrary/article/0_0_0/lines_02 interested me. It gives you evidence on evolution that proves a lot of religion wrong. Th University of Berkeley has done a great job with this website. Great find, Daniela. Wow I can’s wait for next semester to study the theory of evolution! I have always been curious with everything that has to do with our ancestors and whether the big bang theory is true. I mean it really makes sense the fact that we can have a common ancestor with primates or monkeys or whatever seeing the way we have changed physically, we might resemble. http://lexfridman.com/blogs/thoughts/files/2012/05/evolution-300×208.jpg here is an image of the theory of evolution. “Every creature that exists is unique, and this is essential for evolution.” I agree with this statement that was introduced at the beginning of the video that you posted explaining evolution and how it came to be. Every creature through sexual reproduction has different types of traits making it unique and different from others of its kind thanks to the specific kinds of DNA codified into genes. Natural selection has also a lot to do with this. With natural selection traits best accommodated for the survival of a species prevail in order for a species to continue and to later adapt and evolve. As is with the case of the finches in the Galapagos. Who knew that two kinds of finches could create such a wide variety of new and evolved finches! I guess you do learn something new every day. Generations of finches—thousands of generations—gave rise to many new species, each of them adapted to their own conditions. I suggest you do some research on the concept «ecological niche». which is the scientific study of human evolution. The field involves an understanding of the similarities and differences in their genes, body form, physiology, and behavior between humans and other species. Paleoanthropologists search for the roots of human physical traits and behavior. The link also talks about the process of evolution that involves a series of natural changes that causes species to arise, adapt to the environment, and become extinct. The interactive mystery skull is amazing. Thanks for sharing, Adriana. Evolution is a concept that can be explained in many different ways because it can have many perspectives depending on knowledge and opinions. Here is a video which I found very interesting and helpfull for understansding evolution. Hope it can help you! Our world becomes more complex, we appreciate it more, and we can be profoundly amazed by it, because of the knowledge gained through evolution, via natural selection. I really like the topic of evolution. It amazes me to see how we all have a common ancestor. We can see how evolution is the key of life. I looked up more information on this topic and found a very interesting article of a fossil discovery containing genetic material of a “Homo heidelbergensis”. This is an early hominid considered to be the ancestor of both Neanderthals and modern humans. Evolution is the key of life!! Everything depends on evolution and without it our world wouldn’t exist. This video helped me to see clearly this term and understand it. It is very interesting knowing from where a specie came to our world and more important where us humans came from. This is a very controversial topic because there are many theories about the human evolution. I feel like this video is a good way to show students how evolution works. It explores the basic features it’s composed off. Animations are a good way to show information because they entertain the viewer. Specially a topic that is usually considered controversial; it simplifies it, therefore making comprehension easier. Natural selection is all around us, starting with us. We humans are a very diverse species that take part in natural selection and try to employ it in other species. When finding a mate, we humans always start with the characteristics of people, but not just only with advantages traits, but with traits that only determine physic and looks. For example, we humans would take more notice on a person’s looks instead of their traits and intelligence. But we are also one of the only species to pick mates with flawed traits knowing they have flaws like: infertility, diseases with no cures, disability, etc. Even though there are humans who go against nature, natural selection will prevail, and the few people who are left with flaws will eventually die. We also employ natural selection with other living organism like horses, cows, chicken, etc. We cross breed them so we can take the best traits from the two animals and have an offspring with the best traits from its parents. This has been done on humans since the dawn of technology but has decreased in its practice for some time now. At this site, http://www.livescience.com/445-darwin-natural-selection-work-humans.html , I was able to lean more on the subject of how it is still shown in modern day humans. Check out the concept ‘artificial selection’, which is basically agriculture—and, to put it in purely technical terms, biotechnology. Human beings have been tinkering with genetic information for over 10,000 years.